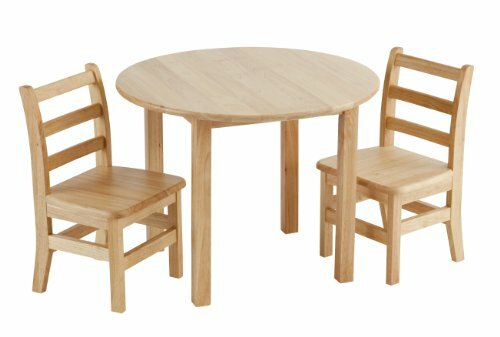 The ECR4Kids round hardwood table and chair set is the perfect addition to any classroom, daycare or home. It is built to last structurally and stylistically. 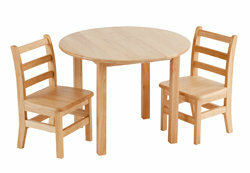 Children will love to sit at the table and draw, eat, read, play with blocks and similar toys. It is the classic setup small enough for an intimate corner and attractive enough to be in the center of it all. The hardwood table and chair set will never go out of style! Perfect for Children Ages 3 and Up! This hardwood table is 22" high for children ages three and up to be at the perfect height. The matching chairs have a 12" high seat surface to fit comfortable at the table. With ample leg room, kids will love having this table all to themselves! 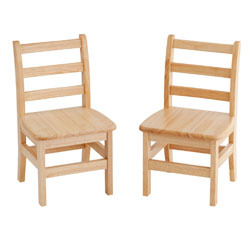 Both table and chairs are made of a solid and durable hardwood with a beautiful natural finish. The 3 rung ladderback chairs have reinforced lower rails, rounded edges for safety, and curved back legs for strength and stability. The 30" round hardwood table is backed by the manufacturer's limited lifetime warranty and measure 1.75" thick with four sturdy 1.75" square legs. Both the table and chairs are easy to wipe clean and built to last. Hardwood table with four legs, two 12" chair frames with all necessary supports, instructions, and hardware for easy assembly.